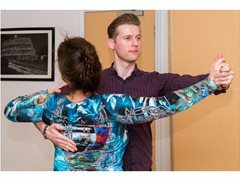 Simply Dancing Partners is a unique Ballroom and Latin dance school where every client dances with a professional partner throughout the lesson. We are always recruiting dancers with solid 10 dance experience who can act as partner/teachers. The classes take place mainly in the evening but we are starting some during the day in Marble Arch and Battersea. I understand the life of a professional dancer and am happy to have you work for me when you have spare time or are between jobs. Most of our clients are women so we really need male dance partners. We run classes every week from September to August. You must be very patient and kind as the clients are generally nervous about their ability to learn the steps. Also very professional in your personal presentation - so smart and good hygiene.